ADAMS GERTRUDE Trudy is the beloved mother and Grandma to multiple generations of the John, Adams and Hinkes clans. She passed away peacefully at home. A truly beautiful soul who will be sorely missed. Funeral at St Bernadette's Church, 49 Jugan St, Glendalough on Thursday (4.4.2019) at 2.00pm. 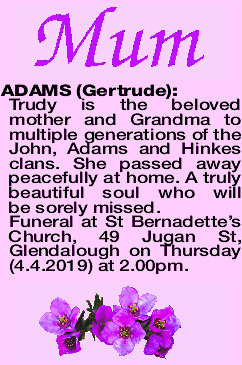 A Funeral Mass for the Late Mrs Trudy Adams of Glendalough will be held at St Bernadette Catholic Church, 49 Jugan Street, Glendalough at 2:00pm on THURSDAY (04.04.2019). To be privately Cremated.